Gold futures ended near unchanged Wednesday, slipping less than 0.1% after climbing just a bit more than that on Tuesday. Gold for June delivery dipped 10 cents to settle at $1,295.30 an ounce on the Comex division of the New York Mercantile Exchange. "Rallies in the U.S. stock indexes to new for-the-move highs today was a negative for the safe-haven metals, but selling interest was tempered by a drop in the U.S. dollar index," Jim Wyckoff, a senior analyst at Kitco Metals Inc., said in a report. 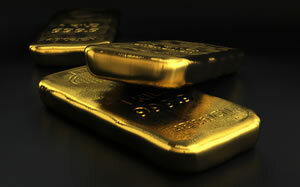 Gold futures traded from a low of $1,292.70 to a high of $1,299. They gained less than 0.1% on Tuesday and fell 0.3% on Monday — ending at their lowest point since March 11. Silver for May delivery added 4.1 cents, or 0.3%, to settle at $15.102 an ounce. Silver futures ranged from $15.00 to $15.16. They declined 0.3% on Tuesday and lost less than 0.1% on Monday. Last Thursday, prices settled at $14.973 an ounce for their worst close since Dec. 24. July platinum tacked on $21.70, or 2.6%, to $874.20 an ounce, trading between $855 and $875.40. Palladium for June delivery dropped $22.20, or 1.6%, to $1,378.10 an ounce, ranging from $1,351 to $1,413. Gold rose 15 cents to $1,290.45 an ounce. Silver added 14 cents, or 0.9%, to $15.165 an ounce.